We've all wondered what it would be like to have a different hair color, but maybe you're not ready for the commitment to make a drastic change. And maybe you aren't sure if you can achieve the color you want without doing something permanent. Here's some information to help you understand the types of haircolor available to you. These products are truly temporary, and are usually sold as color rinses. They're used most often to cover or mask gray hair, or to add a subtle (or even a bold) tone to your natural color. Temporary color sits on the outside of the cuticle and adds color to the surface of the hair. Temporary hair color won't take you from a darker shade to a lighter shade, but it can add some depth and richness to lighter hair. Temporary colors rarely last beyond your next shampoo. Temporary hair color can be found in a variety of products: rinses which add color to the hair and are styled dry, color mousses which add subtle color tones, hair mascara for dramatic effects, spray on colors for controlled application, and even color-tinted shampoos and conditioners to add depth and longevityto colored hair. Semi-permanent and demi-permanent hair colors are similar in the way they work, but slightly different in their formulation. Semi-permanent color is designed to deposit color onto the hair only and has no lightening effect. The formula includes an activator that develops the color and helps to raise the cuticle of the hair shaft so that the color can be deposited there. Semi- permanent color doesn't penetrate into the cortex of the hair, but it will usually last from six to eight weeks, gradually washing out with each shampoo. Demi-permanent color is also a deposit-only color with no lightening effect. The difference between the Semi- and Demi-permanent colors is that with demi-permanent color the color molecules are smaller and therefore penetrate into the cortex of the hair, as well as being deposited on and in the cuticle. This makes demi-permanent hair color a better choice for covering gray hair. 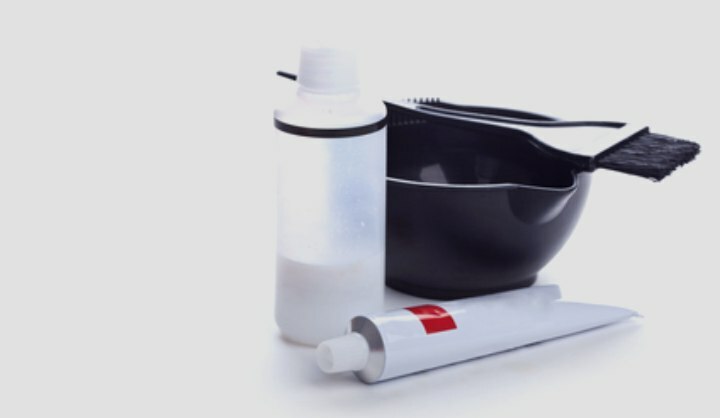 The color achieved also lasts longer, but will fade due to the formulation of smaller color molecules being able to come back through the cuticle with each shampoo. Permanent colors are designed to penetrate the hair shaft and deposit their color directly into the cortex of the hair. The formula contains a developer to raise the cuticle and allow the color molecules to penetrate into the cortex, and also contain aniline derivatives which combine with hydrogen peroxide to produce larger tint molecules which are then trapped inside the cortex. By virtue of their formulation, permanent hair colors are able to deposit color, but can also be used to lighten the color of the hair, depending upon the strength of the hydrogen peroxide used as a developer. If the desired result is simply the addition of color with no lightening in level, then your colorist will typically use a 10-volume peroxide developer. To lighten the hair one-to-two levels and add a color, 20-volume peroxide will be good. 30 and 40-volume peroxides are available to lighten the base level even more, but remember that the stronger the peroxide the harsher the effect on your hair. It is best that you never use anything stronger than 20-volume peroxide developer without the assistance of a professional to closely monitor the results.